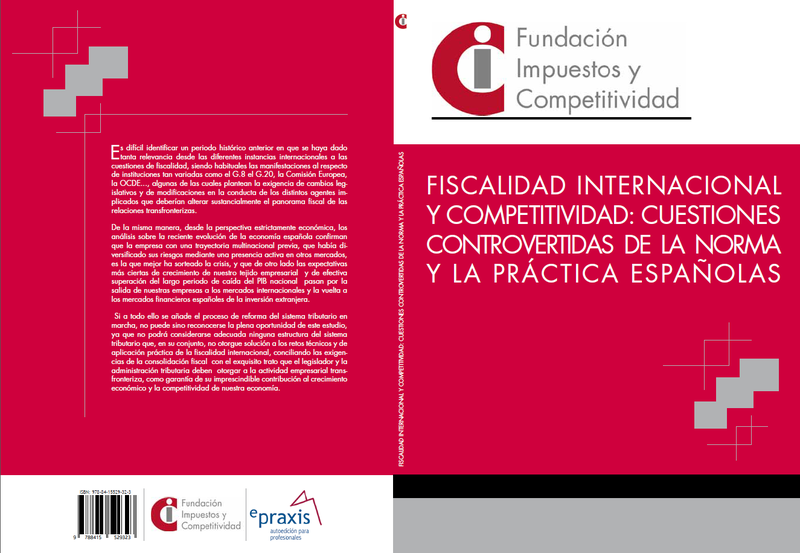 The Tax and Competitiveness Foundation (Fundación Impuestos y Competividad)publishes its new book: “International Taxation and Competitiveness: controversial issues of the Spanish rule and practice”. Within the general focus of the Tax and Competitiveness Foundation, centred on finding solutions for the Spanish tax system that enable the Spanish and European economies to achieve maximum competitiveness, it is not surprising that the Foundation has launched a study on International Taxation and Competitiveness. The study addresses the main controversial issues raised by the tax treatment of cross-border relationships. This is a highly topical issue given the unusual attention that numerous international courts have been giving to tax issues in recent years, and the issues are certainly highly relevant to the competitiveness of the Spanish economy irrespective of the tax system established for income sourced abroad by Spanish companies and the tax treatment applicable to foreign investments in Spain. 1) Taxation of permanent establishments, 2) corporate income tax on income obtained by Spanish companies abroad, 3) controversial issues relating to non-resident income tax, and 4) taxation of expatriates. The result is an agile and highly practical document, which offers a detailed diagnosis of the current problems of international taxation from a Spanish perspective, and an ambitious list of proposed possible solutions. The book contains an executive summary at the end, whichoffers a remarkable insight into this area of the Spanish tax system. Among the noteworthy conclusions of this work is the need, in order to counteract the considerable complexity of the current system and additional instability brought about by the general review of the governing principles of international taxation, to establish clear firm rulesfor addressing the problems identified, reducing the current legal uncertainty which is particularly worrying within the scope of Spanish corporate income tax.